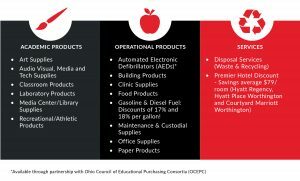 From Art Supplies to Chocolate Milk, the OSC Cooperative Purchasing Program saves districts from the time-consuming bidding process and provides discounts up to 63% off through our extensive catalog of locally-bid, awarded vendors. All Co-op Purchasing is available to members at no additional cost. krocco@osconline.org or (216) 447-3100 x 6103 to learn more.